ORION CONGREGATION is a meeting of musicians, each on his own journey, coming together to share stories, to listen and to observe. Their only shared language is music, and between them they are fluent in many dialects, from european classical music to jazz to the music of the deserts of Mali and Niger and the many flavours of sound, song and rhythm that were being called “contemporary” at one time or another in different parts of the world. 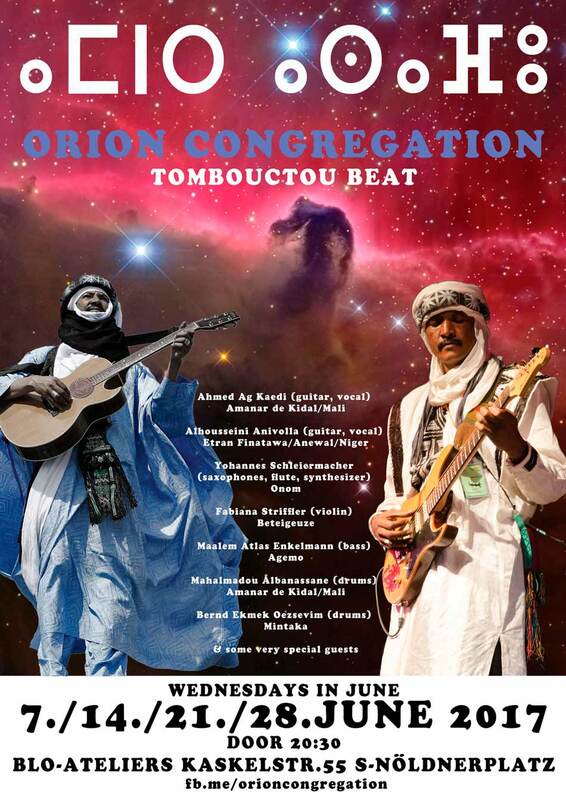 Ahmed Ag Kaedi (guitar, vocal), Alhousseini Anivolla (guitar, vocal) and Mahalmadou Albanassane (drums) represent a modern energetic interpretation of the desert blues, a style whose roots grow deep in the Sahara and whose branches have touched music lovers all over the planet. Civil war has displaced many of the Tamasheq people, especially musicians who were forced to either trade their guitars for guns or leave their homes when extremists took hold in the northern part of Mali. When Ahmed Ag Kaedi was threatened to have his fingers cut off if he were to continue to play the guitar in his home town of Kidal, he chose to flee first to Niger, where he met his cousin Alhousseini for the first time. He eventually settled in Bamako, understanding that even in exile, his music was a more powerful weapon than any gun could ever be, that this was his best chance at regaining his home. With his band AMANAR DE KIDAL he has since traveled all over the world, played for thousands of people and even had his story told in movies. Yet if he could, he would still trade it all for the calm of the desert and the stars above. Yohannes Schleiermacher (saxophones, flute, synthesizer), Yilmaz Hochapfel (synthesizer, organ), Maalem Atlas Enkelmann (bass, guembri) and Bernd Ekmek Oezsevim (drums), the european part of the congregation, are all individually accomplished performers and improvisers. In their project ONOM AGEMO they explore the rhythms, the modes, the spirits, and the roots of music, trance and dance. The caravan will be completed with the appearance of the incredible master musician Fabiana Stuff Striffler (violin) and the planetary music experience of Michael Wehmeyer (duff, piano) of the legendary EMBRYO world-music-collective. Alhousseini Anivolla’s journey started in the desert of Niger, where he was born and raised. While his ancestors used camels and boats to conduct trade all over North and West Africa, it was music that allowed Alhousseini and his message of respect and peace to travel all across the globe. Gaining international recognition as the lead singer and guitarist of the groups ETRAN FINATAWA and ANEWAL, he now lives in Berlin, the „world capital of musicians“, where he honors tradition by innovating and connecting.